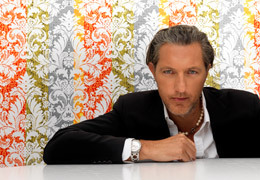 Marcel Wanders’ fame started with his iconic Knotted Chair, which he produced for Droog Design in 1996. He is now ubiquitous, designing for the biggest European contemporary design manufacturers like B&B Italia, Bisazza, Poliform, Moroso, Flos, Boffi, Cappellini, Droog Design and Moooi of which he is also art director and co-owner. Founded in 2000, Moooi has grown into an internationally renowned design label. Additionally, Marcel Wanders works on architectural and interior design projects and recently turned his attention to consumer home appliances. Marcel was the editor of the International Design Yearbook 2005. In the same year, together with Chef Peter Lute, he established the extraordinary LUTE SUITES hospitality-concept, the first "all over city suites" hotel in the world. He also designed the interior of Blits, a new restaurant in Rotterdam and the interior of the restaurant ‘Thor’ at the Hotel on Rivington in New York including bar, lounge and private club. Marcel is the first and among the most important designers of Droog design. He was a juror for various prizes like the Rotterdam Design Prize (for which his own products were nominated several times) and the Kho Liang Ie prize. He lectured at SFMoMA, Limn, the Design Academy, Nike, IDFA, FutureDesignDays and has taught at various design academies in the Netherlands and abroad.